Lie 5: "We are not engaged in politics"
Oil companies looking for oil in Western Sahara will say that their operations should not be viewed as a political act. 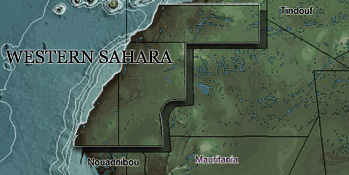 However, the oil industry in Western Sahara is about as political as it can get. "The company has the long-term interest of Morocco in mind, and we are fortunate to be working in a country known for toleration and moderation." Oisín Fanning, CEO San Leon Energy, July 2015The very nature of doing business with Morocco in occupied Western Sahara is highly political. It lends an unwarranted sign of political support to Morocco's claims over Western Sahara, and offers a greater stake for the Moroccan government and its nationals in the continued occupation of the territory. In this way, the companies can be seen as taking a position in the conflict, siding with Morocco's illegal annexation of a neighbouring country. The companies tend to adopt Morocco's narrative about Western Sahara. Invariably, the companies' official documents such as annual reports etc, will locate their prospect in "Morocco", or in an area falling under the Moroccan government's administration, completely side-stepping the question of Saharawi resource rights. The cut-out quote to the right is taken from Total SA's 2014 annual report as filed with the United States Securities and Exchange Commission. The same formulations are repeated annually. 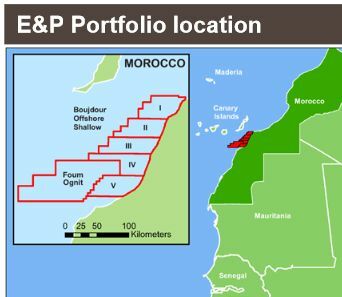 Below are examples of Moroccan maps from Glencore. “Kosmos Energy, of course, has no political role regarding the status of Western Sahara”. Kosmos Energy, Position Statement on Western Sahara, February 2014.The problem goes far beyond seemingly paying lip-service to Morocco's self-proclaimed sovereignty in Western Sahara in order to get access to the territory. Some of the involved companies have hired lobbyists who are flewn around the world to try to influence investors and governments who may look into divesting from the involved oil companies over concerns for international law, human rights and ethical standards. As such, the Moroccan government has found an entire lobby-apparatus in the oil industry, doing the heavy lifting of making Morocco's control over Western Sahara and its resources seem normal. The Moroccan government by proxy. “We feel good about the knowledge base we’ve got … and we honest to God feel like we are doing the right thing in partnering with Morocco… We encourage the peace process to go on, and may the best party win”. Kosmos EnergySo while the United Nations attempt to broker a peaceful solution to this protracted conflict, the oil companies in Western Sahara actively work to create an appearance of legitimacy for the occupation. Morocco's colonial project in Western Sahara is made more acceptable by economic activity in the territory; and Big Oil is a major player in this dirty political game.